solid waste (MSW) management . studies, especially for landfill siting [9,10]. with GIS for landfill siting include: [5,15,16]. has been widely used in many research studies [19,20]. particular address solid waste management issues. legislative direction and with insufficient financing. resent usually 30% - 40% . and their locations grossly threatened the environment. °C and an average rainfall of 164 mm/year. to 98˚ with an average of 6˚. metals, wood, and fibers . Figure 3. Location map of the study area. 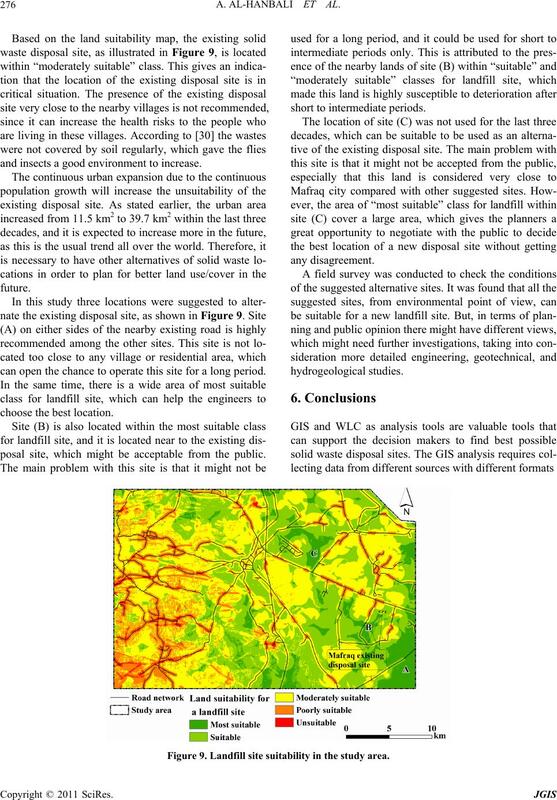 area based on analysis of Landsat TM 1989.
lection criteria using WLC and GIS. 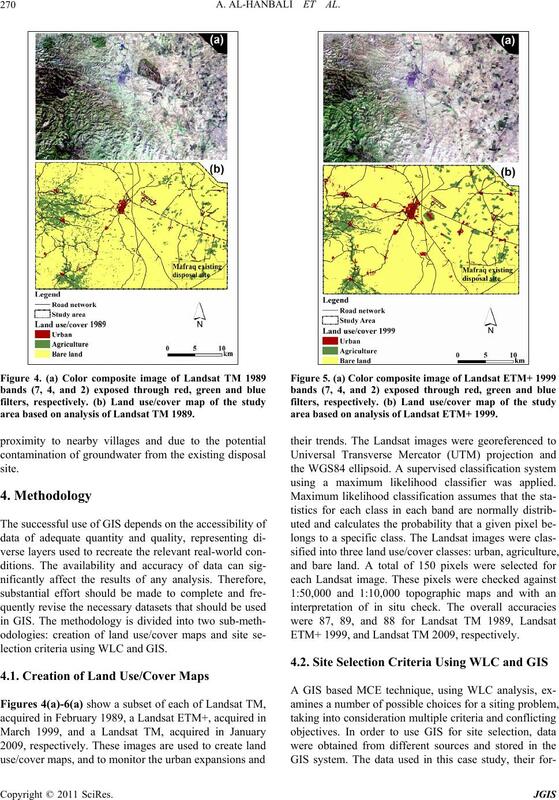 area based on analysis of Landsat ETM+ 1999.
using a maximum likelihood classifier was applied. ETM+ 1999, and Landsat TM 2009, respectively. selecting solid waste disposal sites in particular. rameters based on the local conditions of the study area. range from the “most suitable” to “not suitable”. 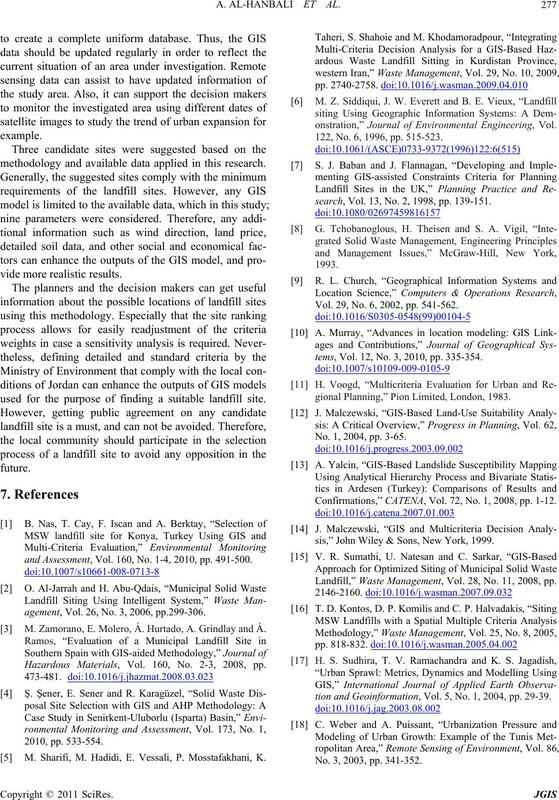 area based on analysis of Landsat ETM+ 2009.
mats, and their sources are available in Table 1. Table 1. The geospatial data used in this study. and xi is the criterion score of factor i. Table 2. Attribute scores and weights for the maps used in the landfill site selection. in order to reach the water table. which can lead to a negative effect on the community. its direct influence on the community. pressures on the existing solid waste disposal site. 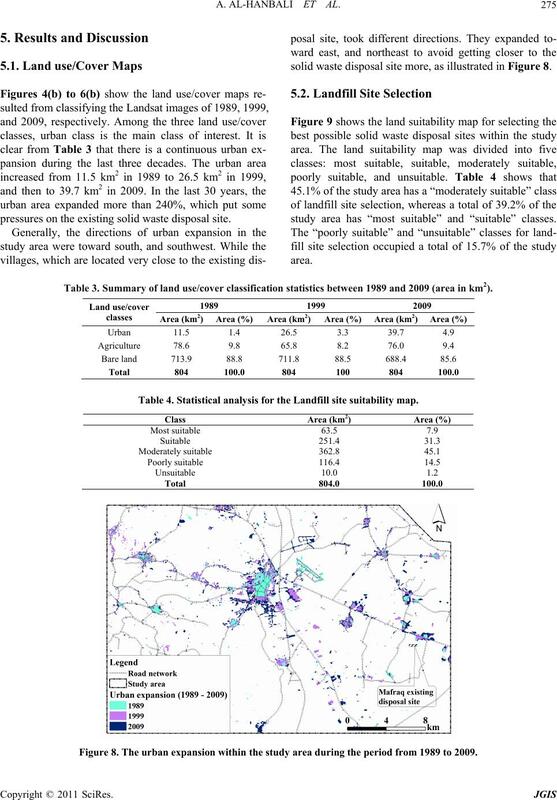 solid waste disposal site more, as illustrated in Figure 8.
study area has “most suitable” and “suitable” classes. Table 3. 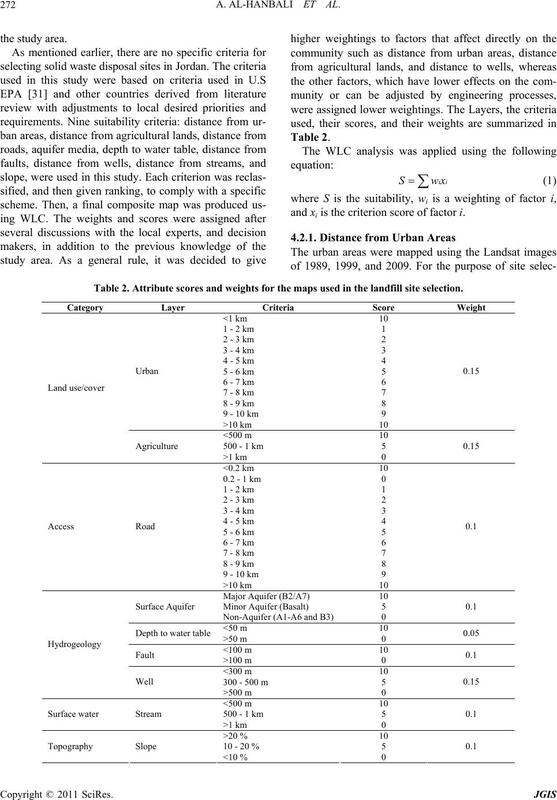 Summary of land use/cover classification statistics between 1989 and 2009 (area in km2). Table 4. 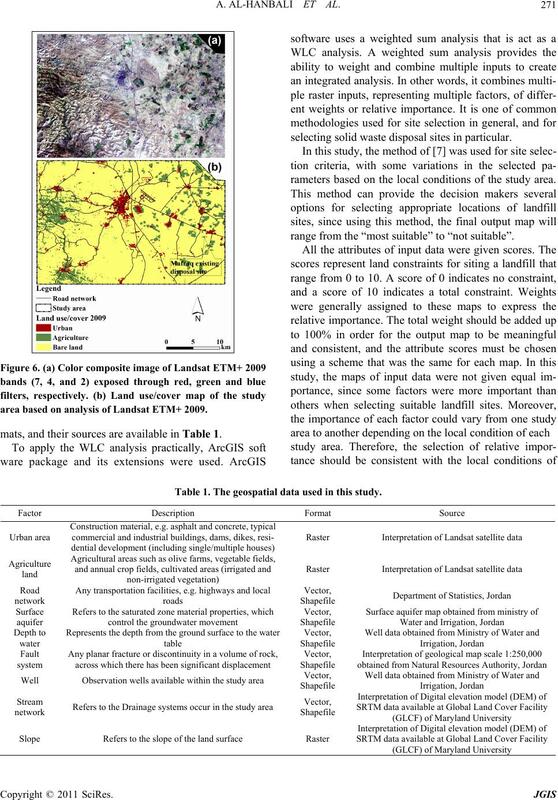 Statistical analysis for the Landfill site suitability map. Figure 8. The urban expansion within the study area during the period from 1989 to 2009.
and insects a good environment to increase. can open the chance to operate this site for a long period. posal site, which might be acceptable from the public. Figure 9. Landfill site suitability in the study area. methodology and available data applied in this research. used for the purpose of finding a suitable landfill site. and Assessment, Vol. 160, No. 1-4, 2010, pp. 491-500.
agement, Vol. 26, No. 3, 2006, pp.299-306. M. Zamorano, E. Molero, Á. Hurtado, A. Grindlay and Á. Hazardous Materials, Vol. 160, No. 2-3, 2008, pp. 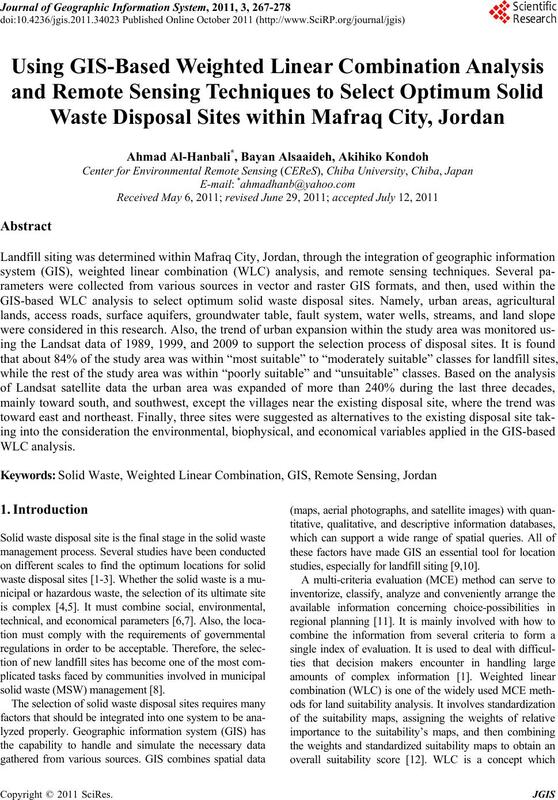 M. Sharifi, M. Hadidi, E. Vessali, P. Mosstafakhani, K.
onstration,” Journal of Environmental Engineering, Vol. 122, No. 6, 1996, pp. 515-523.
search, Vol. 13, No. 2, 1998, pp. 139-151. Vol. 29, No. 6, 2002, pp. 541-562.
tems, Vol. 12, No. 3, 2010, pp. 335-354.
gional Planning,” Pion Limited, London, 1983. No. 1, 2004, pp. 3-65. Confirmations,” CATENA, Vol. 72, No. 1, 2008, pp. 1-12.
sis,” John Wiley & Sons, New York, 1999. 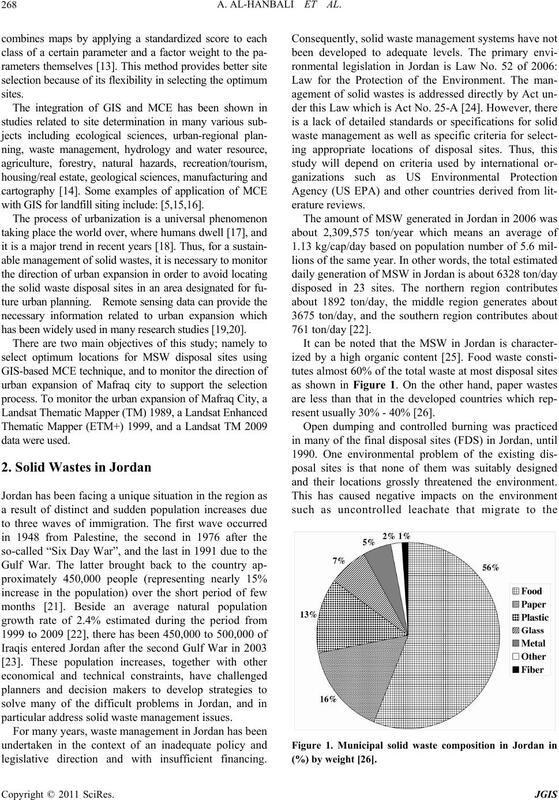 Landfill,” Waste Management, Vol. 28, No. 11, 2008, pp. tion and Geoinformation, Vol. 5, No. 1, 2004, pp. 29-39. No. 3, 2003, pp. 341-352.
plied Geography, Vol. 29, No. 3, 2009, pp. 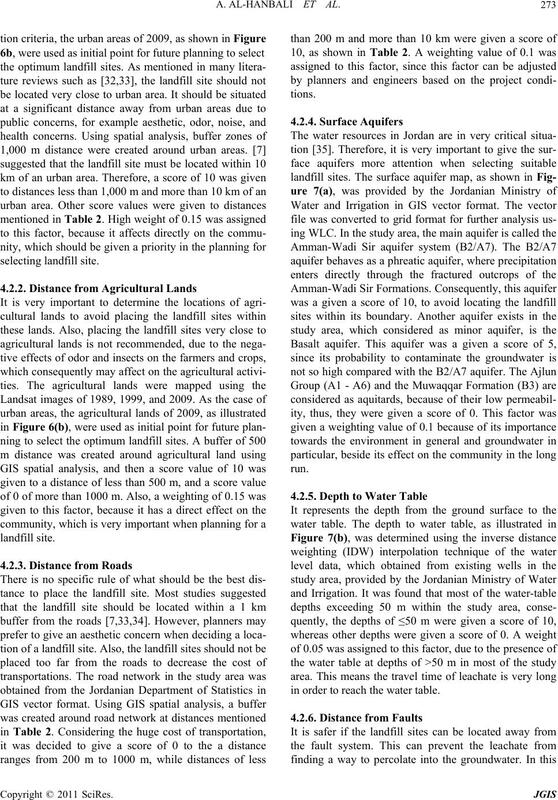 390-401.
key,” Environmental Monitoring and Assessment, Vol. 136, No. 1, 2008, pp. 289-297.
sues,” Habitat International, Vol. 33, No. 1, 2009, pp. Department of Statistics (DOS), 2010. Ministry of Environment (MoEnv), 2010. Management, Vol. 27, No. 11, 2007, pp. 1666-1672. Policy, Vol. 10, No. 4, 2008, pp. 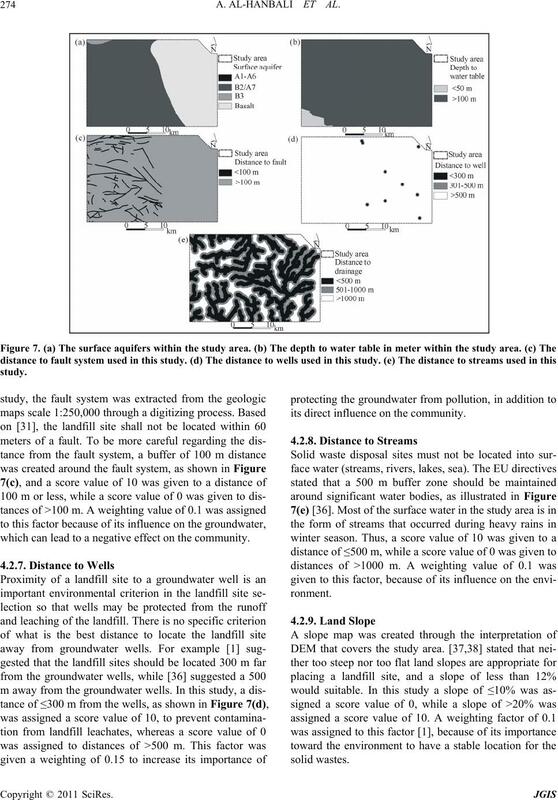 341-350.
nal of Arid Environments, Vol. 49, No. 3, 2001, pp. National Geospatial-Intelligence Agency (NGA), 2010.
ternational Cooperation Agency, Tokyo, 1996. EPA530-R-93-017, US EPA, Washington, DC., 1993. Management Association, Vol. 53, No. 5, 2003, pp. No. 1, 2008, pp. 139-153. O. 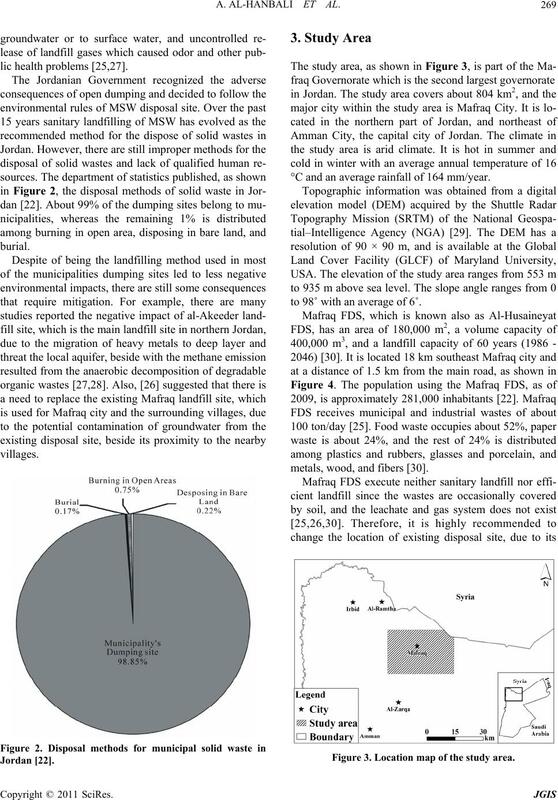 B. Delgado, M. Mendoza, E. L. Granados and D.
Mexico,” Waste Management, Vol. 28, No. 7, 2008, pp. nation, Vol. 250, No. , 2010, pp. 197-202. No. 3, 2003, pp. 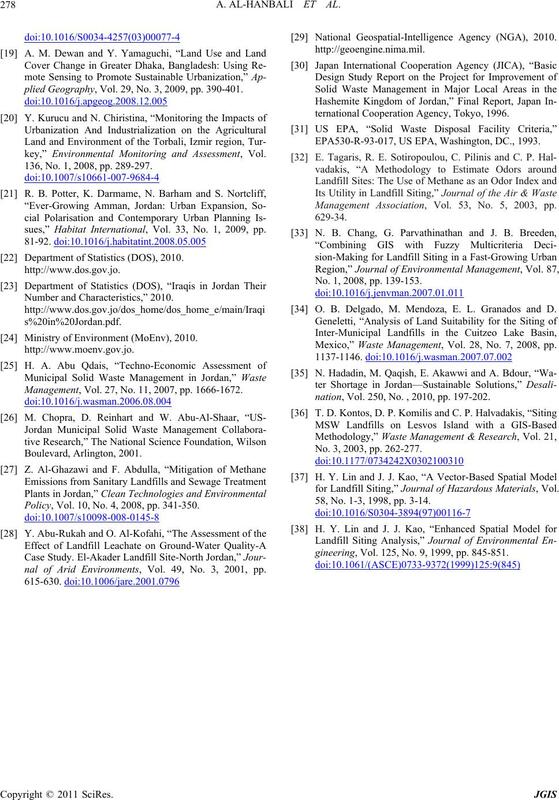 262-277.
for Landfill Siting,” Journal of Hazardous Materials, Vol. 58, No. 1-3, 1998, pp. 3-14.
gineering, Vol. 125, No. 9, 1999, pp. 845-851.